Each year, FRAXA Research Foundation awards research grants with the ultimate goal of delivering specific treatments and a cure for Fragile X syndrome. 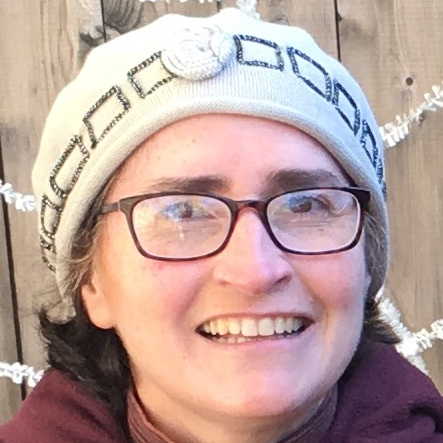 This year Carol Wilkinson MD, PhD, a postdoctoral fellow at the Boston Children’s Hospital received a two year clinical grant to work with Principal Investigator Charles A. Nelson, PhD to identify neural markers of cognition, language, and behavioral deficits in young children with Fragile X syndrome. The grant was co-funded with the Pierce Family Fragile X Foundation and the Autism Science Foundation. What are Neural Markers and Why are They Important? Biomarker studies in Fragile X patients are essential for objectively monitoring the efficacy of treatment or drug trials. Neural markers are biomarkers for the brain: objective brain-based measures that consistently correlate to specific characteristics of a disease, such as Fragile X. For example, electroencephalography (EEG) is now being used to identify differences in the pattern of brain activity in children with neurodevelopmental disorders. EEG based neural markers may also predict challenges in different developmental domains, such as language, cognition, and behavioral impairments. How can Neural Markers be Used Practically? “In mouse models of Fragile X many drugs show promise but then have failed in clinical trials. This is not necessarily because they don’t work well, but rather that they may only be effective in a subset of the population, and then don’t demonstrate a positive outcome when averaged together,” explains Wilkinson. If we can determine what distinguishes one brain from another, and if a drug works with a particular neural marker or set of neural markers, this would permit matching drugs based on objective biological markers, a personalized medicine approach, rather than defaulting to the current method of trial and error. How are Neural Markers Measured? Wilkinson uses EEG, a safe, low-cost, noninvasive tool for analyzing electrical patterns of activity in the brain – the neural markers. While this sounds scary, walking into the EEG lab space is a completely kid-friendly experience, with bright murals at child-eye level. 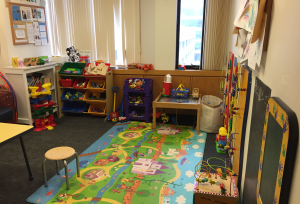 Immediately you are greeted by a play room packed with toys for siblings or study participants on sensory breaks. The small EEG evaluation rooms, themed Jungle, Mario, Aquarium and Farm, are padded and quiet, with comfy couches in the outer rooms to get the children acclimated. Many children with Fragile X have seizures or sleep disruptions and so have already had EEG evaluations with sticky electrodes that are probably the most annoying part of the procedure. In Wilkinson’s studies, there is an EEG cap, like a hair net with imbedded buttons and a chin strap to hold it on snuggly. The child sits on a parent’s lap on a chair and is assisted by a research assistant while another researcher collects the data. What Data are Collected and Why? How might a Fragile X brain respond differently to its environment. Consider a child with Fragile X, overwhelmed by a situation. The problem could be how he senses or processes sounds, sights, or blinking lights. It could be that she is more sensitive to stimuli or that he has a more intense response. It could also be that while others become desensitized, like to bad odors that seem less powerful over time, she does not. It could be any one of these or some combination. Therefore, Wilkinson breaks stimuli down into simple tasks, looking at brain responses to visual and auditory tests compared to a resting situation. The visual tests involve looking at checkerboards with reversing patterns, and the auditory stimuli are beeps with varying frequencies, very similar to hearing tests. This is why the EEG room looks so much like an audiology lab. While the children look and listen, data is collected. While the tasks are simple, the data sets are not. In each of the regions of the brain, Wilkinson looks at the activity within particular brain waves or frequency bands. These can be markers of overall connectivity within the brain, the ability of the brain to process information. When a child is looking at a pattern or listening to a sound, specific parts of the brain process the information, and there might be changes in the strength or pattern of the response to incoming stimuli. By evaluating large EEG data sets in combination with standard measures of cognition, language, and behavior, Wilkinson can look at responses to sensory input and draw connections between brain activity and development in the Fragile X population. Who can Participate and Why So Young? Young boys with and without Fragile X between the ages of 32 – 66 months may participate. “The reason for looking at this younger population is that we’d like to intervene therapeutically as early as possible because of brain plasticity, but most EEG studies have been done in older children. We know that patterns of brain activity change during development, so we need to know what these potential neural markers look like at younger ages, when we hope to provide therapies”, explains Wilkinson. When Will the Study Begin and How Can I Get Involved? The study will begin in the Fall, 2017. One-time visits will be scheduled at the family’s convenience, including weekends, and siblings will be allowed to accompany the family. Parking cost and a small stipend will also be provided. For more information or to enroll in the study, please contact Carol Wilkinson via email at carol.wilkinson@childrens.harvard.edu. To learn more about the Nelson Laboratory at Boston Children’s Hospital, check out their website. Fragile X is caused by the mutation of a single gene on the X chromosome, which was identified in 1991. Despite 28 years of intense research efforts, new biological mechanisms of the Fragile X protein are still being discovered and explored as potential therapeutic targets. Genetic disorders with multiple genes and heterogeneity are much more difficult to resolve, so if progress is made in Fragile X, the implications can be generalized to other populations. For example, a new drug being developed by Autifony Therapeutics with the support of FRAXA may be effective in treating sensory hypersensitivity in Fragile X patients, and may also be effective for treating people with schizophrenia. The biological target, an ion channel, was identified as the result of research in the Kaczmarek laboratory, also sponsored by FRAXA. If we identify reliable neural markers, the Fragile X field will have a powerful and safe tool to assess treatments in upcoming clinical trials.